ChiIL Mama : TONIGHT: Avondale Restaurant Trolley Crawl 5/15 Just $20! 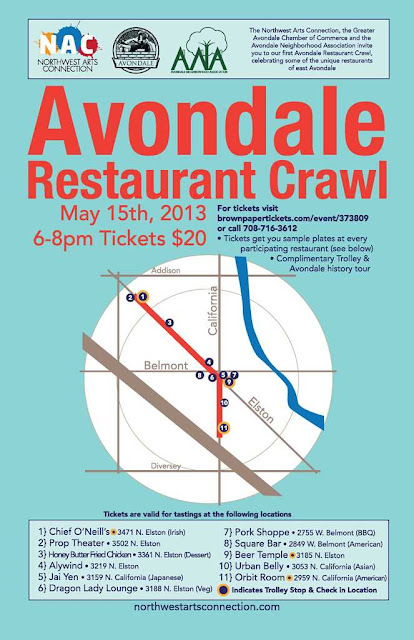 TONIGHT: Avondale Restaurant Trolley Crawl 5/15 Just $20! The Northwest Arts Connection, a rockin' non profit, is launching their first major event tonight--a trolley ride restaurant hop around my artsy, happenin' neighborhood, Avondale!! Northwest Arts Connection is a group dedicated to making Chicago's Northwest Side known as a destination for the arts - visual, performing, horticultural, and culinary. Check it out. Tickets are just $20! Click here to order.